Arabdemocracy: It’s the economy… stupid! First and foremost, I should thank/apologize to Bill Clinton*- or more appropriately his brilliant campaign chief James Carville- for stealing their 1992 US presidential campaign slogan and using it as a title for my article. Having said this, I should clarify that this is not an article about the former or even current American presidential campaign. Finally, I should tell you what this article is actually about. It is about everyone’s favorite topic: Hizbullah! And make no mistake, it is everyone’s favorite topic. If you don’t believe me, just check the number of comments any article that mentions the word Hizbullah receives on this site. In fact, if you want your article read by a lot of people, just plant the word Hizbullah at several key points throughout your article and enjoy the response and the popularity it brings with it! But I digress. What, you may ask, does Bill Clinton’s 1992 campaign slogan have to do with the controversial Lebanese movement? Good question. A lot in fact. A major question that surrounds Hizbullah is why is it so popular? Almost every analysis you read- generally by us self-styled intellectuals of every ideological color, shape or form- concentrates on one (and occasionally both) of two main arguments. The first is what I shall call the argument from theology. This tends to be the argument of those who are either right of center and know it, or who are right of center but haven’t realized it yet (for example the Decoratic Left Movement, as Dr. Samah Idriss so eloquently calls it). The argument goes something like this: Hizbullah binds its followers by a bond of theological allegiance to the concept of “Wilayat al Faqih” which- as those intellectuals put it- dictates obedience to the Theologian-King (e.g. the Supreme Leader in Iran), the self-claimed representative of the 12th Shia Imam (i.e. Al-Mahdi) whose return the majority of Shia are thought to eagerly await. Please note that it is rather likely that the Supreme Leader himself is not terribly eager for Al-Mahdi to return, since that would mean the end of his own supremacy… but again, I digress. Add this formidable spiritual bond to the traditional “minoritarian” thinking of the Lebanese secterian mind et Voila: the magic potion that endears Hizbullah to its Shia base. Problem solved. Liberal thinker go home happy!Ridiculous! Cries the leftist intellectual- at least of the sort still stuck in 1973 or thereabouts and glued to different chairs of various communist party committees. Stuff and nonsense! They counter with what I shall refer to as the argument from dignity. Hizbullah is supported by its base because of its formidable resistance to the Zionist enemy and its military victories over occupation. These victories have restored dignity to the nation and offered hope that the eternal armed struggle shall defeat the enemy and liberate the holy land (in which case it would of course cease to be eternal). Viva la Revolucion! This hope for a dignified future free of occupation and oppression by the Zionist gang and its imperial masters is what guarantees the allegiance of the masses to what is- au fond- a working class liberation movement. And that’s that. Time for leftist intellectual to resume paperwork on behalf of the disenfranchised. So, this is the gist of what you usually read- or more horrifyingly- watch on Arabic sattelite channels during the course of “political talk shows”. Brrrrrrrrrrr! You almost never hear these analysts ask themselves the simple question of why people actually support anyone. And that’s where Bill Clinton- or rather his brilliant slogan- comes in. Yes, people want to live in dignity and freedom. But that usually starts by having a place to live in and meal to eat. It starts by not having to choose between dinner and sending your kids to school. It starts by having paved roads to facilitate economic and social life. It starts by having access to water and electricity to wash your clothes and keep clean. It starts by earning your living through your own labour. In other words, it starts with the sort of dignity that the Lebanese political system has not only failed to offer to the people of the south since independence, but in fact purposefully denied them. That is the sort of dignity that Hizbullah has been systematically offering people in the south of Lebanon and Beirut’s southern suburbs since the early nineties. And that is exactly why the old Hizbullah of the early eighties- despite “Wilayat Al-Faqih” and despite heroic resistance to occupation- was almost universally loathed and feared, even among the Shia. They learned their lesson very quickly, and with ruthless efficiency: the route to people’s hearts and minds passes through their pockets. And once you have their hearts and minds, you become invincible. There is probably no better demonstration of this fact than the aftermath of the 33-day war whose anniversary we are celebrating this week. Witness what happened to the reconstruction efforts run by the Lebanese government (i.e. 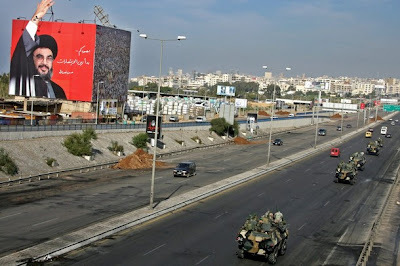 dismal failure, highway robbery, and disgraceful secterian hate-mongering) and contrast that with what Hizbullah succeeded in doing (temporary apartments, a higher rate of restoration, small scale corruption and, by-and-large, even handedness). All that with significantly less money one must note. So there-in lies their secret. Hizbullah delivers. Not only on its political and military promises, but more importantly, more fundamentally, on the promise that “its people” will live in dignity…of the sort that actually counts when you wake up every morning. * William Jefferson "Bill" Clinton (born William Jefferson Blythe III on August 19, 1946) served as the forty-second President of the United States from 1993 to 2001. A propos, here’s a joke for the Arabic speakers among you: Bill Clinton wu shrab mayytoh! I will behave as one of those who are turned on by any mention of the Hezb. I agree with the core of your analysis and wish the Lebanese system was able to provide these essential services to the Shiia community and others as well. I also wish the 'intellectuals' of all creed would demistify Hezbollah and indeed Hassan Nasrallah, whether they consider it an evil islamist group or 'the mother of all resistance movements'. We need to treat it for what it is first and foremost, an efficient Well-grounded, well-funded, well-oiled, well-trained machine with exceptional organisational and propaganda skills not unlike many others around the world. Following from that we can decided whether it is a good thing to have them around or not. Thank you for your comments. You are spot on. I have one comment: the neglect I referred to as practiced towards the south, is by no means unique to the south, and certainly not unique to the shia community (whatever that is!). Areas like Akkar in the north were- and indeed still are- seriously neglected. Furthermore, the neglect in the south does not specifically target the shia community. Of course there was discrimination within the misery, but Hasbayya was never much better off than Khiyam for instance. Obviously, I specifically focused on the south and the shia in this article because that is what is relevant for understanding the power and popularity of Hizbullah. PS: see you in Beirut in a few days! Bassem - I'm not sure it's only about the economy. If it were then, one wonders where the Free Patriotic Movement or the Socialist Party draw their respective support. Something should be said about everlastingness, which is how Lebanese and Israeli politics have played out over a long time. More specifically in Lebanon, the mentality of persecution prevails among many citizens. It's about the economy when the basic needs aren't met. But when they are, bring on philosophie, the deity, and principles. You are correct. It is not only about the economy, but it is primarily about the economy, particularly in the case of the south where, as we all know, decades of official neglect lead to frustration and marginalization. Indeed, as you say, when the economic factors are relatively satisfied, other factors gain in importance. However- and without going into a lengthy discourse- these factors continue to operate in the service of the economic factor. I'd be happy to discuss that with you further privately to save space and time for other readers. I should finally like to note that I specifically suggested what you argue for in the article when I wrote: "the route to people’s hearts and minds passes through their pockets. And once you have their hearts and minds, you become invincible." In other words, when you satisfy the economic, you can work on the rest! The other point, I'm afraid, is too dangerous for an old man like me to risk getting into! Dear Bassem - I would be very interested in discussing this issue further. I've always been interested in better understanding the history of politics and how decisions and allegiances are shaped by sociology, politics, etc. Do you facebook? If so I can add you and we can go from there. I'm relunctant to share my personnal email address on here as I fear it could be used for spam emails. Also, I am very important and don't want people to get my contact information. Very important. Marwan - keeper of the obvious.